Think about your favorite entry doors; where did you see them? Maybe you saw a sunny yellow door at a friend’s house and you found yourself especially drawn to it. Perhaps the neighbour’s bright teal front door strikes you as trend-setting detail for your cottage-style home. The point is, a well-selected entry door colour makes an instant impact on your guests; a positive first impression. Plus, it helps to raise the value of your home. 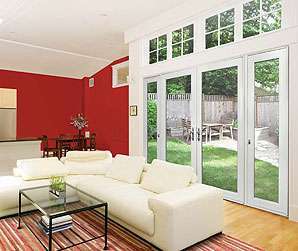 If the time has come for you to take a second look at the shade of your Toronto, ON home entry door, keep reading for some advice from our professionals here at Brock Doors and Windows. Monochromatic: several shades of the same colour—shades of gray, shades of red, etc. Analogous: colours found side-by-side on the colour wheel—red and orange, yellow and green, blue and purple, etc. Let me explain. Your home’s front door can and should be a tool you use to your benefit. If you choose a unique shade it will instantly become indicative of you, your family, and your home. Your guests will learn to use it as a “Wayfinder!” Colour yields emotions in us all. When your door colour fits well with your home and stands out from the rest, it’s inviting, it’s warm, it’s a feel-good conversation starter. Yes, there are “colour rules” (as we’ve outlined already)—but there are also cues you can take from your home’s architecture and personality. For example, a bright fire-engine-red may not be well suited for a traditional-style, brick read structure. Know that your home is a great guide for you to discern what works and what does not. Take stock of the materials and colours your home already has to help guide you in the right direction. So, what colour do you choose? Sunny yellow? Eggshell green? Navy blue? Slick black? A custom shade? Come visit our experienced professionals here at Brock Doors and Windows! We would love to help you choose the right entry door for your home—and the right colour to suit your home’s personality and uniqueness. With our selection and customization options, you can not go wrong. We will see you soon!